I have been wanting to do a careful comparison of my many fountain pen and drawing inks and finally washed over the samples to see which are waterproof. I drew the squares in pencil, draw a line on the left on dry paper and touched the line with water to make it bleed. I then did a second line on the then-wet paper to see how it dispersed in wet. Then I did the cross-hatching on the right of the square on dry paper, then painted the rectangles and allowed all of them to dry completely. I then painted a wash of water through the square and some immediately re-wet, others were completely waterproof. 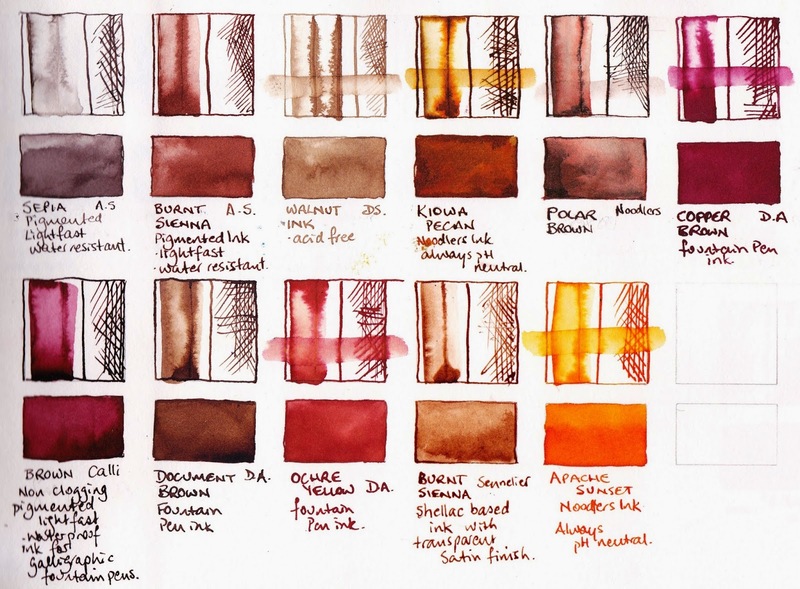 For writing you may not need to use waterproof ink, and even for drawing you may prefer to have water soluble ink if you wish to use water to create some tones. I just like to know what my materials will do. The inks were tested using a dip pen with a 'post office' nib as that is how I prefer to use them, except the De Atramentis inks and Lamy Blue which were in fountain pens. The colour of the Copper Brown and Calli Brown is certainly rather crimson, but not as much as the image on my computer :-( Ochre Yellow is rather orange but most of the others a reasonably accurate in colour. Many companies, such as www.gouletpens.com, offer samples for a reasonable price and also have painted/drawn samples to view on their websites. The A.S (Art Spectrum) pigmented inks are terrific for drawing with a dip pen. They are waterproof and lightfast and highly pigmented for good strong colour. I shake these well before use. The Calli inks were also completely waterproof. I am using Da Atramentis Document inks in Black and Brown in my fountain pens and am very happy with them. I'll also use their regular non waterproof inks for writing and some drawing, and Lamy inks in my Lamy pens. The rest I prefer to use with a dip pen in the studio. My gosh, those are some gorgeous colors. 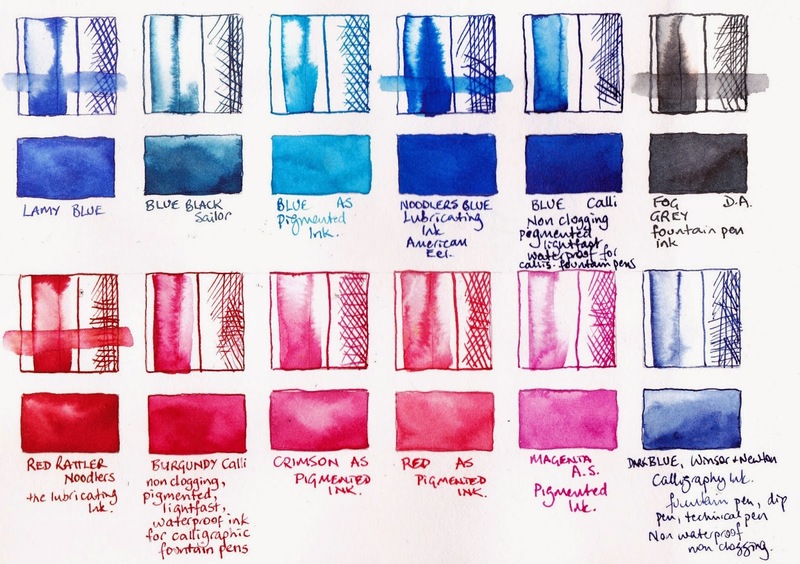 A Lamy pen is on my wish list so then I can indulge in some beautiful colors for both writing and drawing. I can't wait. Maybe sometime next year. This year I know my family is getting me a full palette of schmincke and daniel smith water colors. I can;t wait till christmas!! Have a great weekend Jane! PS. Are you liking Storytelling as much ad the other courses you've taken? I am new to watercolor painting so have a long way to go, but wanted to say that I love your blog. So much great information. Thanks for sharing. I hadn't read this post when I asked you about the DA Brown at Fountain Pen Network. It appears you like it. Yes I really do like it. It is dark enough to give a good tonal range but not so dark that you may as well use black. For writing or drawing I think it's lovely.